The popular Fishing League Worldwide (FLW) angler and Quaker State® ambassador Jimmy Houston, will give the command to start engines Saturday night July 14. “I am honored that Quaker State and Kentucky Speedway have asked me to be the Grand Marshal for the Quaker State 400 this weekend,” said Houston. The popular Fishing League Worldwide (FLW) angler and Quaker State® ambassador Jimmy Houston will give the command to start engines Saturday night July 14. Houston, known to many as "America's Favorite Fisherman," has the extensive outdoor knowledge and colorful personality helped the long-running Jimmy Houston Outdoors (JHO) rank as ESPN's top outdoors show for 20 years. Houston, who is in his 53rd year fishing professional bass tournaments and his 42nd year on National Television with Jimmy Houston Outdoors, began fishing professional bass tournaments in 1968. Over the years, Houston has had many achievements. He has won two BASS Angler of the Year titles and fished 15 BASS Classics and one FLW Championship. Houston also won year-end Classics with American Angler and Project Sports, plus multiple regular season wins with BASS, AA, and PSI. Houston isn’t the only person in his family to have had many accomplishments. His wife, Chris, was the first woman ever inducted into the Professional Bass Fishing Hall of Fame, winning seven Angler of the Year titles, Three Classics, multiple tournaments, and over 25 boats along the way! FLW is the world’s largest tournament-fishing organization, providing anglers of all skill levels the opportunity to compete for millions in prize money in 2017 across five tournament circuits. Headquartered in Benton, Kentucky, with offices in Minneapolis, FLW conducts more than 235 bass-fishing tournaments annually across the United States and sanctions tournaments in Canada, China, Mexico and South Korea. FLW tournament fishing can be seen on the Emmy-nominated “FLW” television show, broadcast to more than 564 million households worldwide, while FLW Bass Fishing magazine delivers cutting-edge tips from top pros. For more information visit FLWFishing.com and follow FLW on Facebook, Twitter, Instagram, YouTube, and Periscope: @FLWFishing. 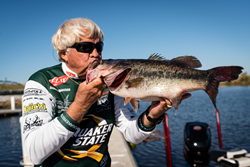 "America's Favorite Fisherman” and Quaker State Ambassador, Jimmy Houston Named Quaker State 400 Grand Marshal.